I know a lot of people say that a romper is a no-no for festivals, but I'm part of that 2% that says otherwise. I live for rompers (just search my blog and you'll see), so when I got this one in the mail just in time for Coachella, I was one happy little chickadee. Because the romper is so beautiful on its own with its white lace cutout details, I opted to dress it up with some metallic tattoos and rep lips. Always red lips. Added a pair of my newest comfiest wedges to finish off the look. I ended up wearing this getup to the People StyleWatch and Revolve Clothing party hosted by Nikki Reed, as opposed to the festival itself. It was such a beautiful party complete with a taco bar, flower crown station (duh) and live music by Jhene Aiko. Stay tuned for my Coachella recap post headed to you later for photos of the party and more. At last, the first set of my Coachella photos has arrived. This year, I teamed up with my pals at Lulus.com to show you some of my festival attire, starting with this number right here! I am a sucker for shift dresses and find they suit my body just right. If you're like me (thiner waist, but wider hips), then definitely look into shift dresses. 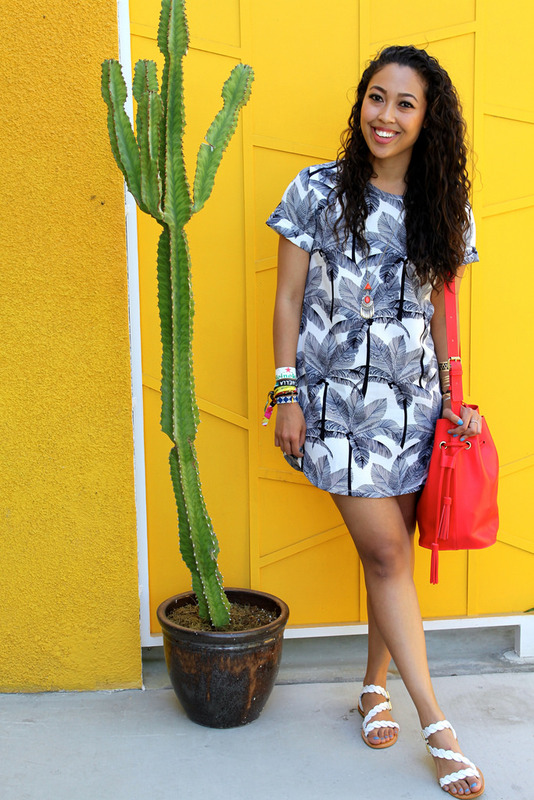 This palm-tree printed one was just perfect for the desert - palm prints in Palm Springs? Very meta. To offset the white and midnight blue (seemingly black) print, I opted for a contrasting bucket bag. As soon as I saw this bag online, I knew I had to have it! It's the most amazing color and so incredibly roomy. I accessorized my look with some Hot Jewels body tattoos because what festival-goer goes without? last weekend, i traveled quite a ways to get my hands on this boba. i wasn't feeling too hot, but decided not to waste my sunday in bed. i reasoned with myself that if i could just get out of bed and into a cafe, to keep up with my spend-part-of-each-weekend-reading-in-a-cafe routine (see, here) that i could treat myself with a matcha green tea latte boba from boba guys (as pictured above) and everything would be a-ok. it was a seemingly sunny day, so i put on my sunday's best (a really cute dress, very appropriate for sunshine), hopped on a bus and got to that cafe. as soon i got there, i knew i had made a mistake. it was freezing and all i had was a light jacket and my bare legs. i thought maybe after i settled in with my book and a cup of hot coffee, i'd be okay. after a couple of hours, i realized it wasn't happening. so, i packed up and made a long walk to get my boba. it wasn't even on my way, in fact, the bus stop home was much closer, but i had my heart and mind set on boba. so i trekked on, for what felt like hours, but it was probably only 15 minutes, anddddd...the boba shop was closed. heartbreak city. i walked all the way back to the bus stop, made my way home and came down with a cold. needless to say, these photos are not from last week. Chino SF 3198 Guerrero Street 2 / 5 Stacks There are a couple things I'm all about in this life - buns and dumplings for sure two of 'em. I've spent the last three or four weekends in the mission. One of my new favorite things to do is spend part of my weekend reading my latest book in a cute cafe (this past week it was One Plus One by JoJo Moyes in Cafe Sophie, and the week before that I was at Four Barrel reading Moyes' The Girl You Left Behind). So, on my way to my various cafes, I've often passed by Chino SF. For those who aren't familiar, Chino SF offers a modern take on classic Chinese cuisines. I'm often put off by "hip" restaurants offering modern renditions of classic meals, but, I am a sucker for a cute space and Chino SF has definitely got that down. Needless to say, they reeled me in with their paper lanterns, light strings, and hip, colorful interior. So was the outside as good as the offerings within?